The Fowlers wanted a minimalistic kitchen that complemented their stunning, open garden space. Having previously worked with Court Homemakers, they were happy to let their designers get straight to work. 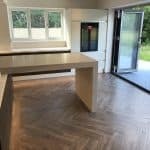 The Fowlers had a large space across the back of their new property for their kitchen, which opens up onto a beautiful large garden and woodland. They asked Court Homemakers for some modern design ideas with a minimalist feel, keeping the kitchen a large open space to complement the open space of their garden. 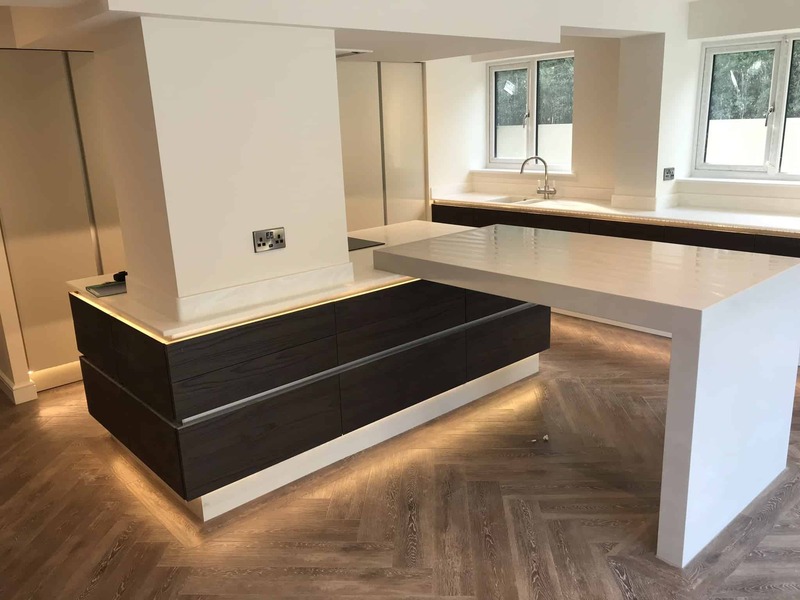 We weren’t exactly sure what we wanted in terms of the style of our kitchen; however, Court Homemakers have previously completed some work for us and so we were more than happy to let their designers come up with ideas for what they thought would work best with our space. They designed a bank of tall units to house our fridge, freezer, microwave, two ovens, and a coffee centre. 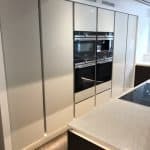 With these items concealed within the tall units, it gives the kitchen a feel of organisation. Court Homemakers created a custom designed drinks preparation area, which is built around the wine cooler. This is perfect, especially for times when we have gatherings at our home. 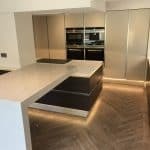 We’re also pleased with the large island in the centre of the room, which can be used for food preparation or as a breakfast bar. The style of the island is blocky and linear, matching the theme of the whole kitchen, and it incorporates the pillar into its design. There weren’t any challenges in particular, although our kitchen had a pillar fixed in the centre of the room. Instead of working around it, Court Homemakers managed to incorporate the existing pillar into the overall design. We had worked with Court Homemakers in our old house. We love the way they work and the ideas they offered and are so pleased with the result. Of course, we would recommend them to anyone!